Three Initial Monogram Mixed Metal Bangle Bracelets - Multi Color Bracelet Set - Choose your favorite 3 letters or numbers for your set of personalized custom initial, multi color bracelets. 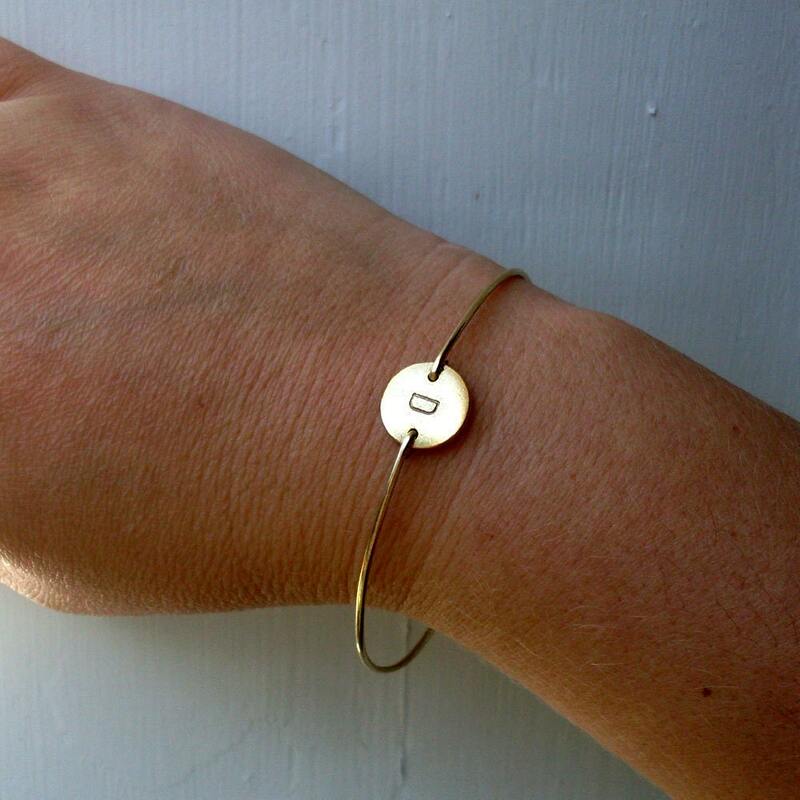 I custom make these dainty hand stamped initial bangle bracelets on discs of three different metals; a small gold plated disc, a small silver plated disc, and a small copper plated disc. 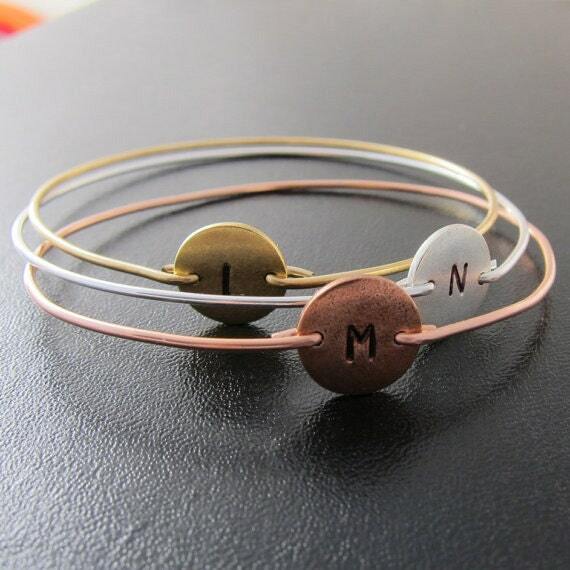 The three initial monogram bracelet discs have a corresponding 14k gold filled bangle band, a sterling silver bangle band, and a copper bangle band. Get a FREE SECRET 2nd letter, number, footprint, star, horseshoe or heart on the back of your three monogram initial, mixed metal bangles. 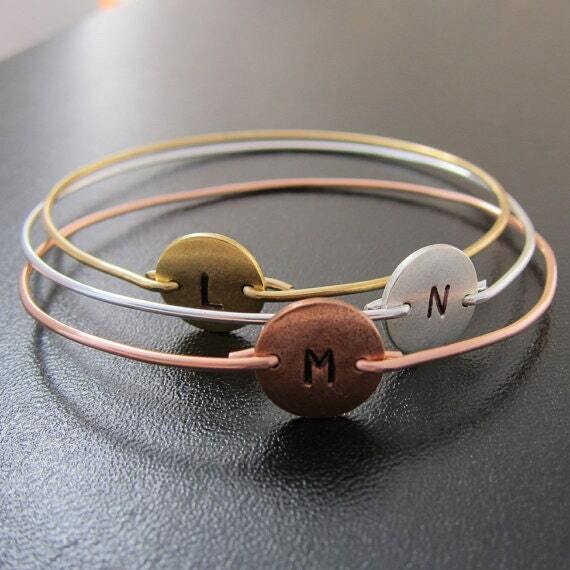 Please specify in notes to seller during checkout and please mention which mixed metal bracelet will get which initial. 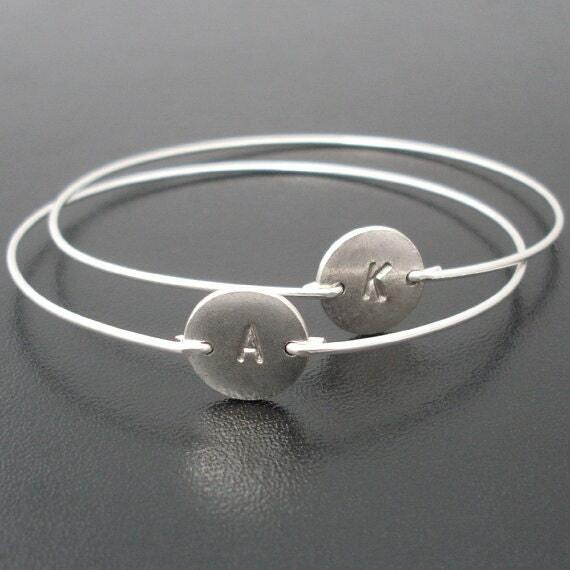 Whichever option you choose, these initial monogrammed bangle bracelets are the perfect monogrammed gift for moms to wear their children's initials, and for grandmothers to wear their grandchildren's initials. If you need multiple monogram gift pieces for your bridesmaids, convo me for a custom listing. 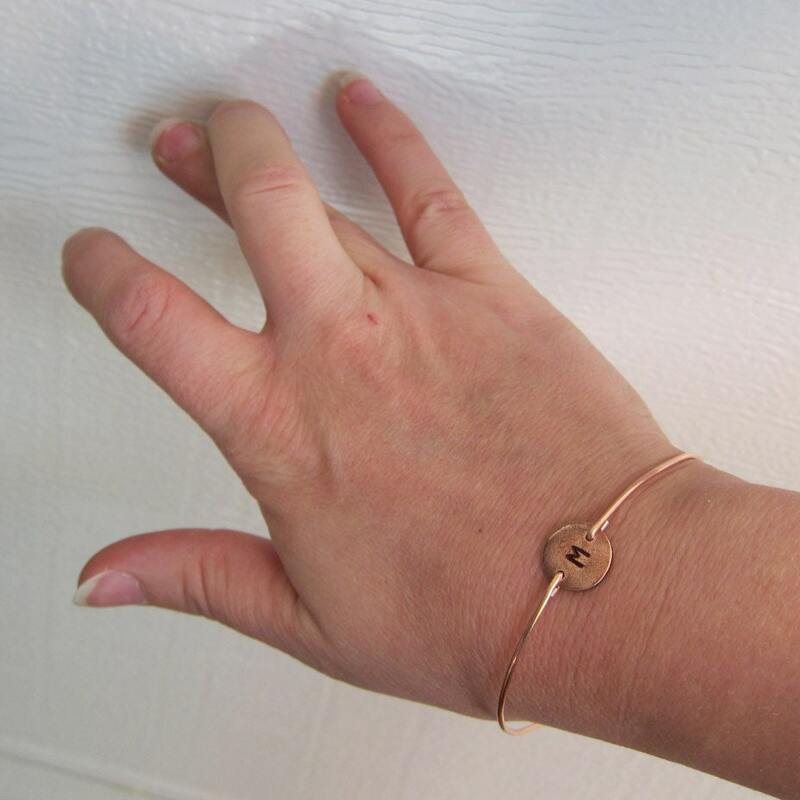 Please specify SIZE in notes to seller during checkout for your mixed metal handmade jewelry. Choose from one of my regular sizes below for your multi color bangle bracelets by measuring one of your favorite bangles... Or give me the circumference of the widest part of your hand where the bangle has to be pulled over; then I can size it for you. All of my bangles are closed and can’t be opened. Therefore, they have to fit over the hand. ♦ For your multi colored bangles please specify which initial or number you want on which color disc in notes to seller during checkout. This multi colored jewelry created and hand crafted with great care and love for you and yours. All of my items including these multi colored bracelet are special handmade creations that are original Frosted Willow designs. Initial Bangle Design Copyright © 2011 Katrin Lerman, Frosted Willow.